elchuqueno.com published this article the other day. According to the article a hearing was held the other day. In attendance representing the city were their out of town attorneys, their bond counsel, the city attorney and “others from her department”. Does the city think they will lose? 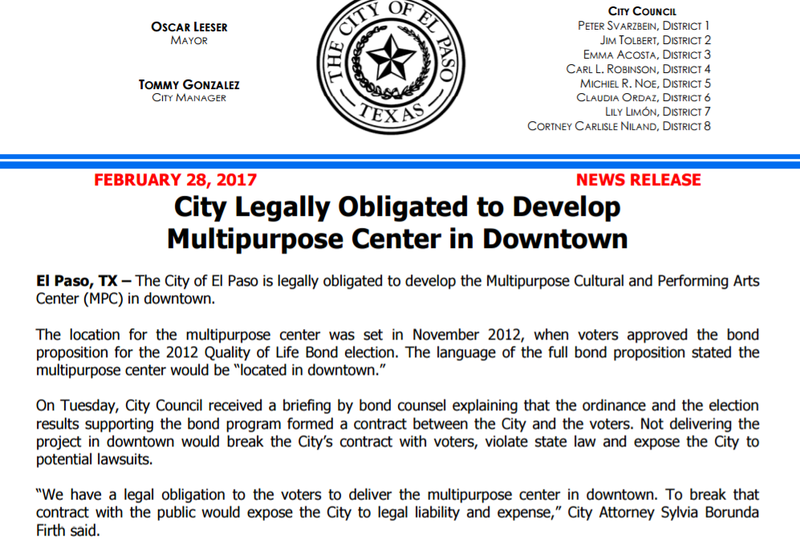 The city could have filed their motion in El Paso but they did not. Filing in Austin makes it less convenient for us to participate. It also gives some of our city employees some travel time. It looks as through their are at least two issues here. One is does the city have the right to build an arena when the voters were asked to approve a “multi-purpose performing arts and entertainment facility”? Another relates to the location. It makes no mention of downtown in either language. Why would the city do that? The ballot language did not say downtown yet the bond election ordinance did. Shouldn’t we expect more from the legion of city attorneys? Shouldn’t we expect more from city council? This entry was posted on Friday, June 16th, 2017 at 5:00 AM and is filed under City government. You can follow any responses to this entry through the RSS 2.0 feed. You can leave a response, or trackback from your own site. Grossman needs to get a life. He had his day in the limelight and is now suffering from withdrawal. If he got his way, there would be no improvements downtown. He protested every little change but failed to come up with one single solution. He is an obstructionist — at best. The city attorneys are nothing more than cheerleaders for the “progressive interests” and the city reps in their clutches. I would think a good attorney will seriously consider many perspectives and possible outcomes of a case but I’ve never seen Firth or any others do it unless they’ve done so in those executive sessions. I’m sure that it is not at all necessary to “go out of town” to find a competent attorney for this City! But, I will agree that we could sure as hell use better legal representation. But, then, don’t forget, I still say we need to dump the City Manager form of government, and go back to a strong Mayor, and hold that person, along with City Council, totally responsible for City operation. Plus, when the bond passed. El Paso voters were under the impression that the City would no longer use eminent domain or displace residents. Right? I seem to recollect that was Cook’s stance and what voters had in mind as votes were cast. Would replacing our current city attorney with a lawyer help? Possibly. I hope Mayor Elect Margo will look at the long string of mishaps, missteps, screwups and take appropriate action. Administration after administration, mayor after mayor and council after council appear to have been given less than sterling advice. It is past time to go out of town to find a professional, experienced and competent City Attorney. Isn’t it odd that City Attorneys, of which there is a gaggle, can’t handle City’s legal business? WTF do they get paid for. In a case representing 4 Pitbull dogs that got loose and allegedly attacked a runner I was able to prevail over the city attorneys office in stopping theiir execution without due process because they, like another current leader we now have succumb to their feelings and took to the media, without actually knowing and following the state laws.